Original watercolor and ink illustration, digital background. 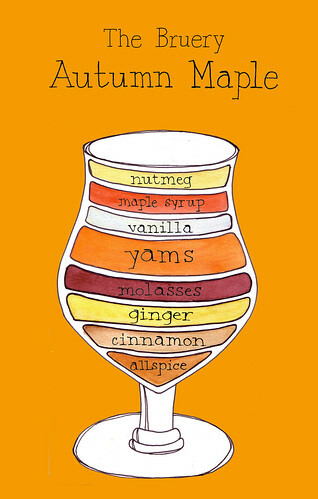 Inside an amazing beer, Autumn Maple, by The Bruery out of Orange County, CA. Positively packed with roasted yams and all sorts of other autumnal delights. This badboy is gracing the homepage of The Bruery. Check it out. Original watercolor and ink illustration. 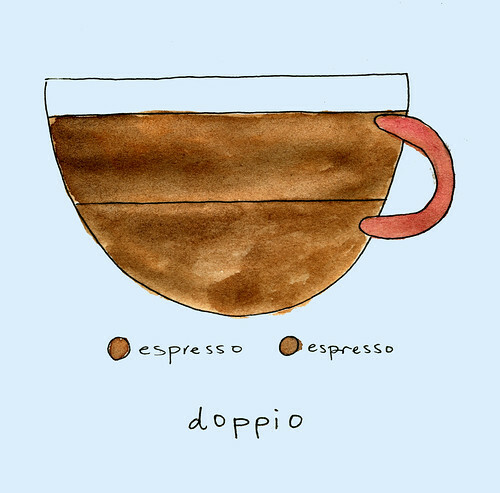 The [double classic] when you just need more espresso. 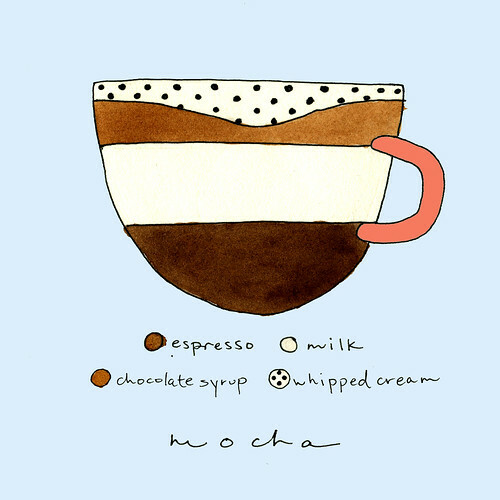 When a normal mocha just isn't enough. Thanks to my pal Mike, whose past stint as a barista provided him with the knowledge of this decaf counterpart to the depth charge. 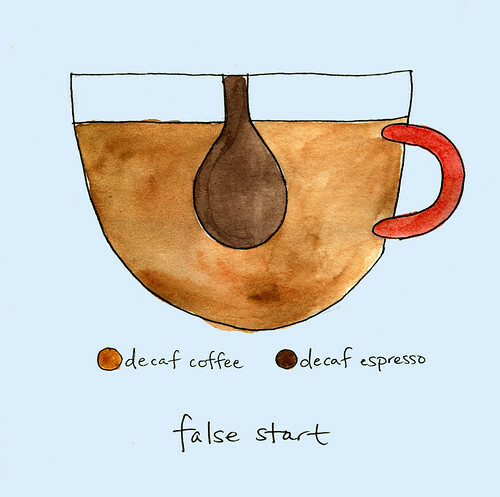 Given my recent shake up with caffeine, this may be a drink I'd order. I'd feel super lame, but at least my heart wouldn't burst out of my chest. 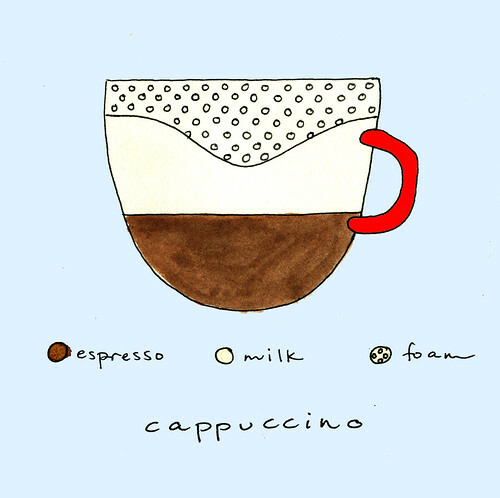 This one wins my "Favorite Espresso Drink Name" award. 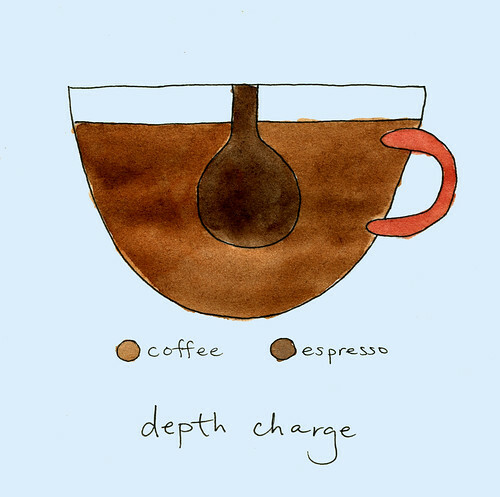 Depth charge, aka shot in the dark, red eye, bulls eye, black eye, or dead eye, is there for you when just espresso or coffee alone won't cut it. This was my drink of choice in Spain, although in Barcelona, it was a "tallat" in Catalan. 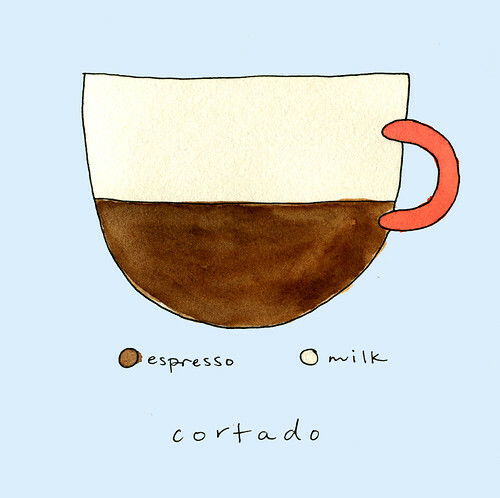 This NY Times post on Cortados and Gibraltars (the latter popularized by Blue Bottle here in SF) is a pretty interesting read. 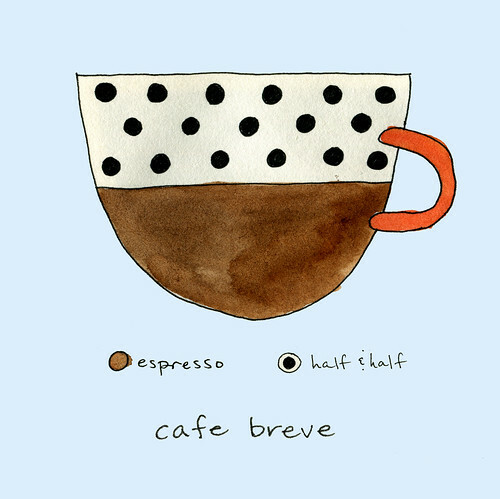 Lots of coffee nerds pissed about the Gibraltar. 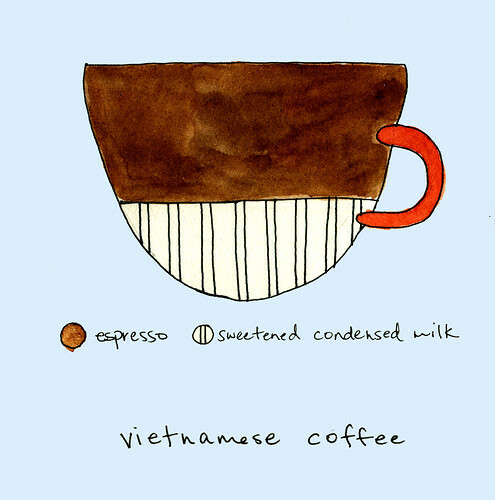 Inside a Vietnamese coffee. Don't skimp on the sweetened condensed milk. Order one when full fat milk just isn't fatty enough for you. 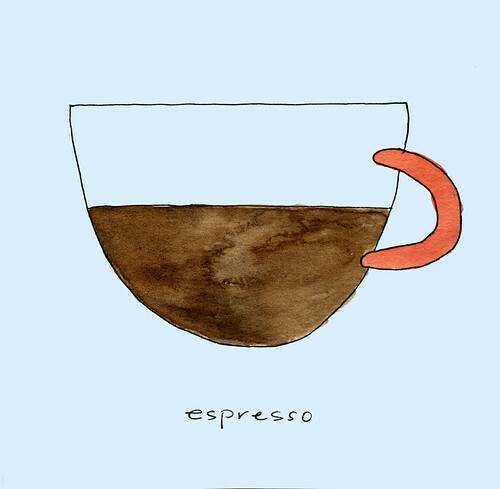 If you haven't had this espresso concoction, you've been missing out. In Italy, I believe the default is typically grappa, but I always prefer sambuca, the tasty anise liquor. I remember one particularly harrowing drive through the mountains outside of Florence, where we had to bypass a closed tunnel to get home. It was late and there were definitely no guardrails on the mostly one-way mountain road. 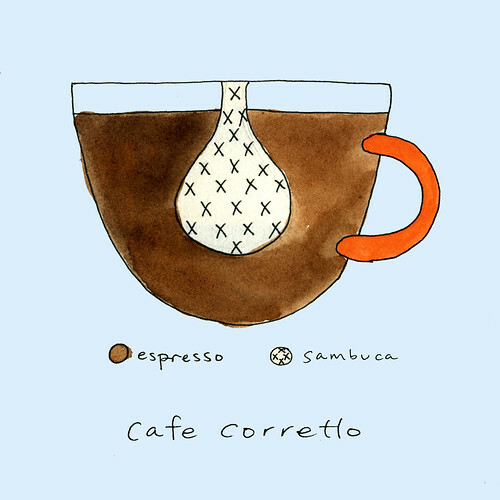 I immediately ordered a cafe corretto as soon as we made it down the mountain. 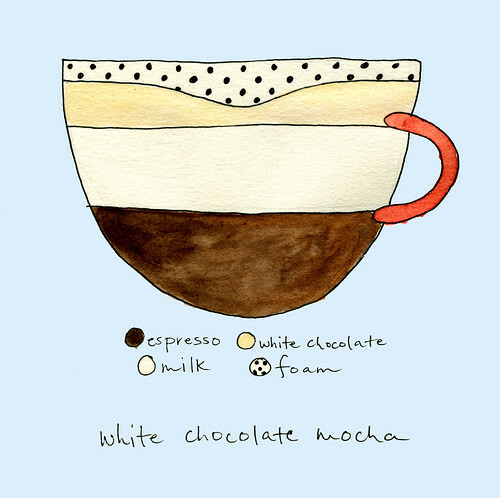 Inside a mocha, the most decadent of the espresso drink ... except for maybe my next diagram. 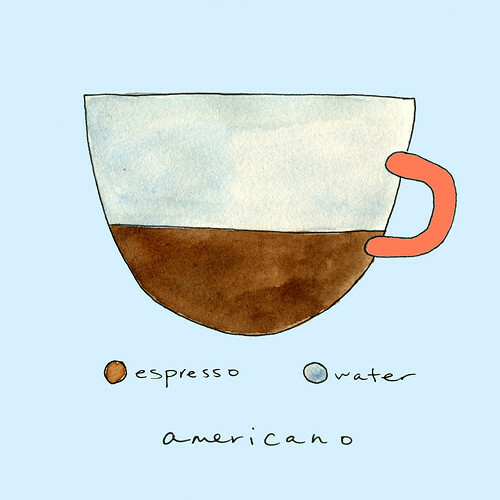 I admit, I've never had an americano. 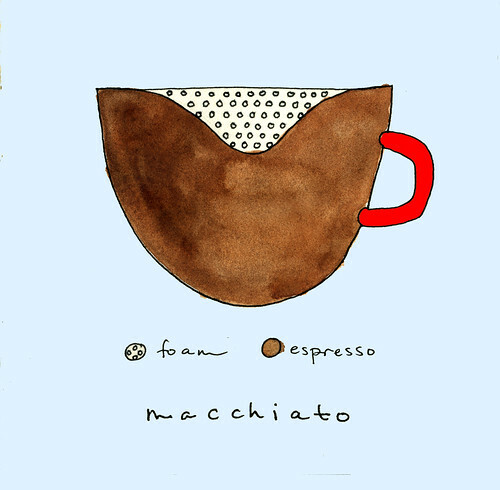 I guess if that's the flavor I'm going for, I'd rather have coffee than espresso. But I see lots of folks order them. ... maybe I should try. 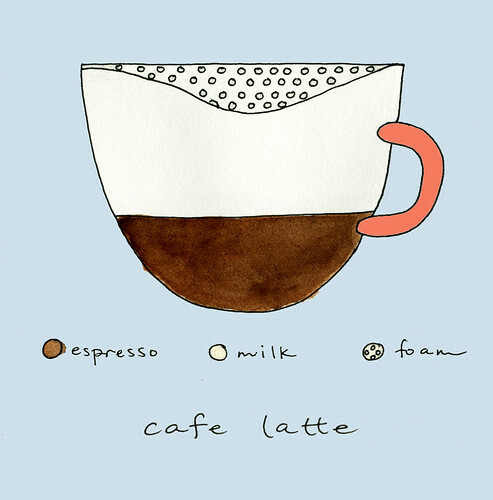 Diagram of a cappuccino ... coffee drinks need butchering too. 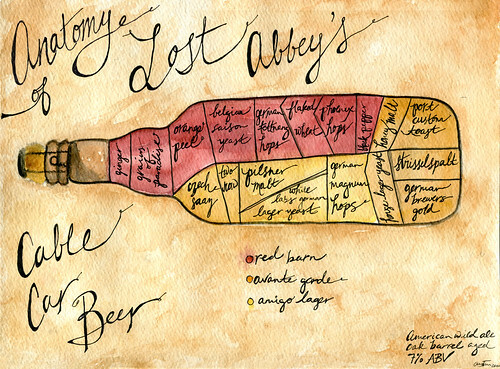 Anatomy of The Lost Abbey's Cable Car beer. This is an American wild ale (or sour ale), brewed by The Lost Abbey, especially for Toronado in San Francisco. It's a blend of three different barrel aged beers by The Lost Abbey. I tried to highlight the major yest, hops, malt, and extras of each. 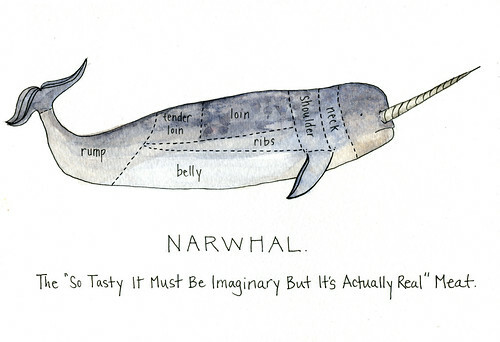 Oh, the narwhal. So weird and wonderful. I was convinced they were imaginary for, well, too long. Inuit people of Canada and Greenland feast on these unicorns of the sea, but I doubt the accuracy of my butchery chart. Want to know what it's like to actually eat one? Check out this article from the Smithsonian. Wish I had read the more detailed description of the filling before painting - it also contains rau ram, aka Vietnamese coriander. He's doing some awesome things in the kitchen. Another milestone. 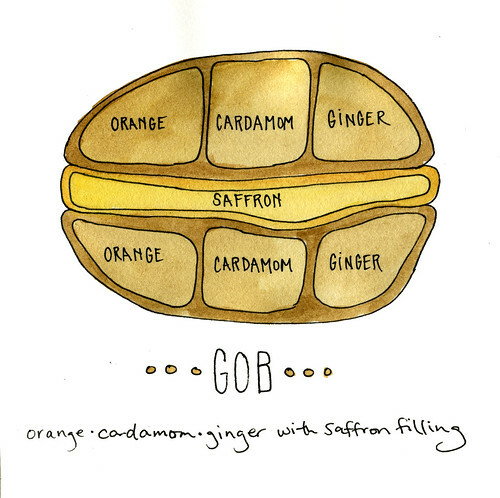 Let's celebrate with a delicious orange-cardamon-ginger gob, with saffron frosting, shall we? 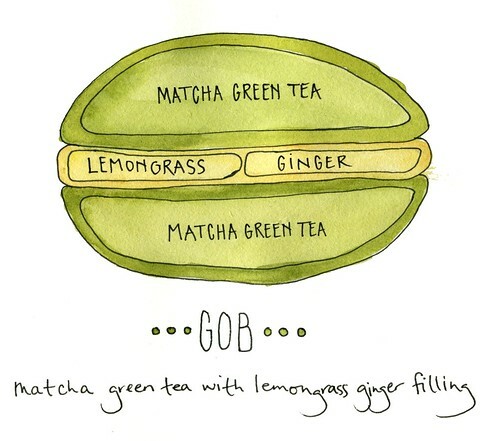 Another inspired flavor combo from San Francisco's own GobbaGobbaHey! It was actually the first of his gobs that I tasted, and they were kindly provided for free the Tablehopper's book release party at BookSmith on Haight St. ( I say his gobs as I grew up with tasty cakey bits. My mom baked a huge batch and brought them in to my kindergarten class for my birthday. My kindergarten class in Texas. The kids didn't know what hit them. 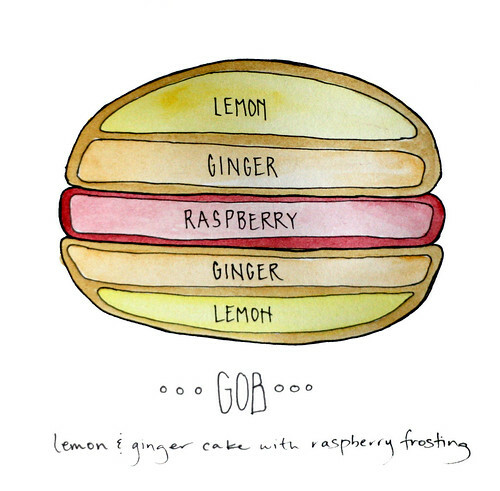 Inside a Lemon & Ginger gob, with raspberry frosting. Inspired by Gobba Gobba Hey, San Francisco's only gob vendor! 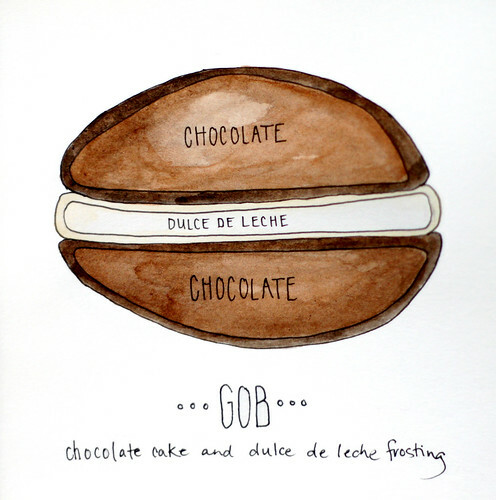 Inside a chocolate gob, with dulce de leche filling. 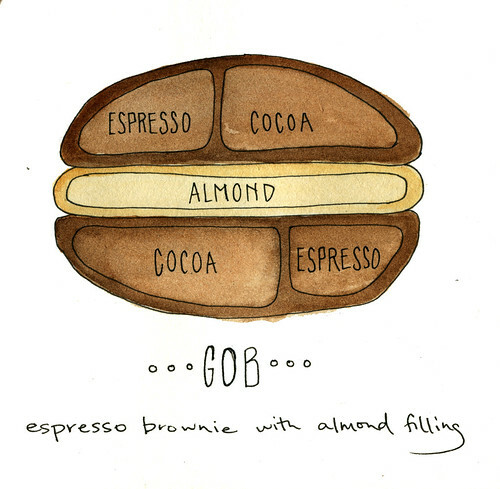 Inspired by the delicious treats of Gobba Gobba Hey, San Francisco's sole gob purveyor. 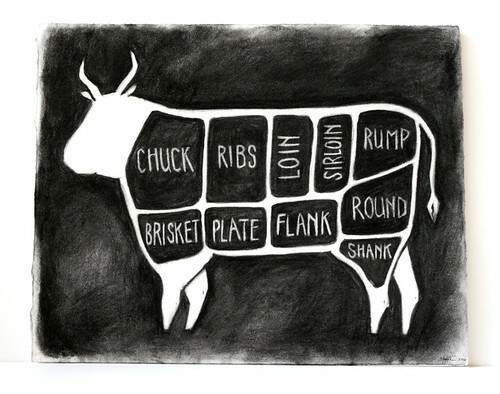 And rounding out the charcoal trio - a lamb butchery chart. Lambs are kind of tricky to draw, with their weird heads. I did several iterations, and I really like this one. He's pretty charming, no? 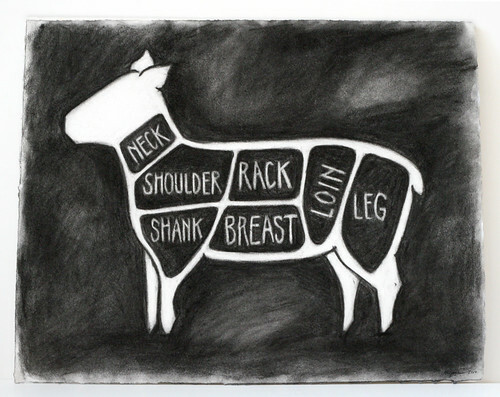 The second piece in the commissioned charcoal series, cow butchery chart. Although the size was WAY bigger than I normally work with, it was still challenging to fit all the cow butchery bits in. So I had to leave off things such as the "shin", "tenderloin", "navel", and "cross rib" but aside from the tenderloin, who ever has a specific need for those bits?